Battle for Burundi After almost two years of insecurity and unrest, many fear that Burundi is dangerously close to a new civil war. The current crisis began early 2015. 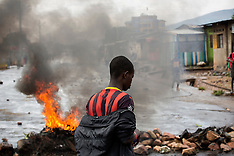 Heavy protests against president Nkurunziza’s bid for a third term rocked Burundi’s capital Bujumbura. After a failed coup attempt in May, all open opposition was crushed and street protests stopped. Journalists and activists went underground. That’s when a new phase begun. At the end of 2015 explosions and gunshots could be heard every night in parts of Bujumbura. Dead bodies were found in rivers and on the streets almost daily. Young men from the protest quarters had begun arming themselves and attacking the police. Since then, the security apparatus has tightened its grip. All forms of dissent gets crushed. Even school children have been jailed for insulting the president. Over 400 000 people have fled the country so far. Meanwhile, the government is becoming increasingly isolated, closing itself to the outside world. Western Sahara: Worst escalation in 25 years For the first time since the signing of the ceasefire in 1991, Polisario and Moroccan troops stand less than 200 meters apart. The Polisario soldiers have their orders: “If they take another centimeter, we shoot”. The current escalation began on the 14th of August, when Morocco started constructing a road in the Guerguerat area, in the buffer zone between occupied Western Sahara and Mauretania. Morocco says the road will facilitate the struggle against illegal trafficking in the area. 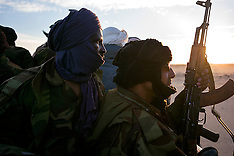 Polisario considers it a violation of the cease-fire agreement and has mobilized its soldiers. A note leaked from the UN states that Morocco violated the cease-fire first, followed by the Polisario. The UN calls this the worst escalation of the conflict since 1991. Any minor provocation might have fatal consequences. Ever since the war between Polisario and Morocco 1975-91, a large group of Sahrawis has been living in camps in the Algerian desert. The refugees have spent the past 25 years waiting for a solution, cursing the cease-fire. This time it might be over.